If you want to extend the boundaries of what you think you can do, then join a small group of people with a mission. I know. I just completed building the website for Loving Garland Green. It is the first website I've ever built. Visit www.lovinggarlandgreen.org and see what you think. If you like what you read and live in the DFW area, then join us! We will be putting in our plant beds in January. We were inspired by the 2013 Garland Neighborhood summit that was hosted here in Garland by various city department employees. Peter Kageyama, author of "for the LOVE of Cities", was the keynote speaker. He spoke of the love affair between people and their places. We are all familiar with such love of place. Who among us does not have a special place we love to visit. Perhaps the two most beloved cities on the planet (at least by their residents) are New York City and Paris France. According to Kageyama, when we love anything, we cherish it and are also enabled to do extraordinary things for it. When we are loved we flourish as people and are enabled to achieve great things. The members of Loving Garland Green would like to inspire residents of Garland to fall in love with their place and do extraordinary things for Garland. We believe that growing food is a direct path to the heart--not only for love, but for health as well. Our core belief is that by increasing the number of urban gardens in our community, we will enrich and grow our local economy and increase the food security for all our residents. According to statistics from Sustainable America, there are 10 million acres of front and back yards in the USA. That's enough to produce 43.5 million tons of food. Our community of Garland has approximately 36,480 acres of land within its boundaries. That's a lot of urban gardens. Loving Garland Green hopes to ensure that we have 50,000 urban gardens growing edible plants within the boundaries of our city by the end of 2016. That's our mission. Those of you who read my posts know me as the woman who dug up half of her front yard this June of 2013 and planted vegetables and fruit trees in place of the lawn. I've written of the magic of my urban garden in terms of attracting people. Over 70 people driving by stopped to chat with me between June 12 and August 6. Prior to that time, not one person in the eight years I've lived in Garland ever stopped to chat with me when I was out in my front yard. I thought about that magic in the evening on Christmas Day. In somewhat of a Grinch mood, I was creating a wish list of resources on our website that we need to get our garden started when a knock at the door interrupted my work. Diane, a neighbor who lives about a block away from me on Kingsbridge, was standing there holding a bag from Arbor Day--our first gift of a plant. The bag contains two Crape Myrtles and six flowering trees. We will plant these trees at the edge of the flood plain on the site. No, they won't feed people, but they will feed the bees that we hope to eventually bring onto the property. 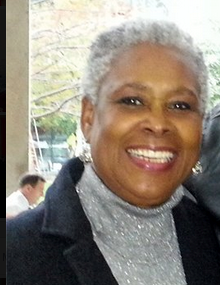 You can see a photo of Diane on the Loving Garland Green website under "Resources." I only met her a few days prior when I was out going door-to-door selling pecans for Loving Garland Green. Again, without the magic of gardens, I likely would never know a lovely person like Diane. Gardens can make neighborhoods more friendly and cities more beautiful and beloved. 3. Chop up two sticks of butter into small mixing bowl. 4. Invite Grandpa to pose for a photo so he doesn't feel left out. 6. 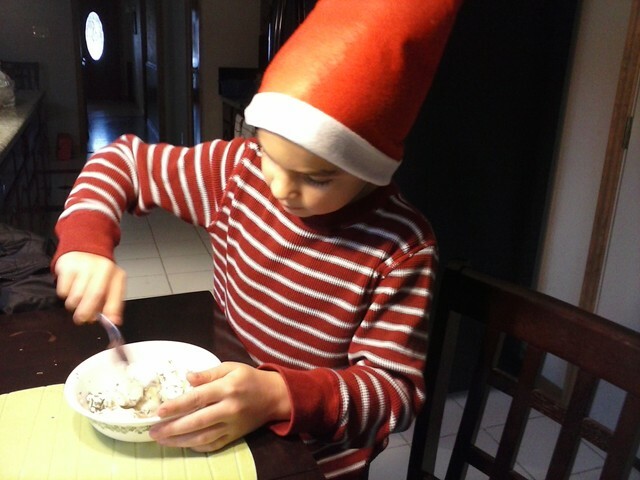 Elf mixes butter and rosemary. 7. Put rosemary butter in bowl, cover with plastic wrap and put in refrigerator to harden. 8. Garnish top of plastic with a fresh sprig of Rosemary and Ribbon. 9. 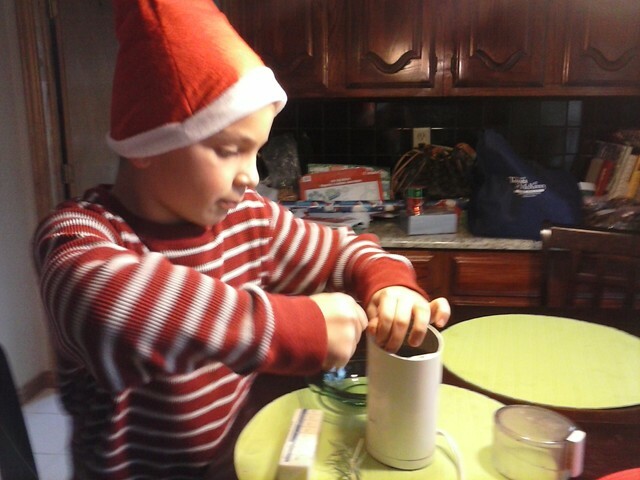 Be sure to inform recipient that the Elf washed his hands carefully before preparing the Rosemary butter. In addition to feeding your family, friends and hungry people in your community, you can give some of the bounty from your garden as holiday gifts too--saving you lots of money while making your friends happy at the same time. If you are not an urban gardener, here is a suggestion for next year. Become one! 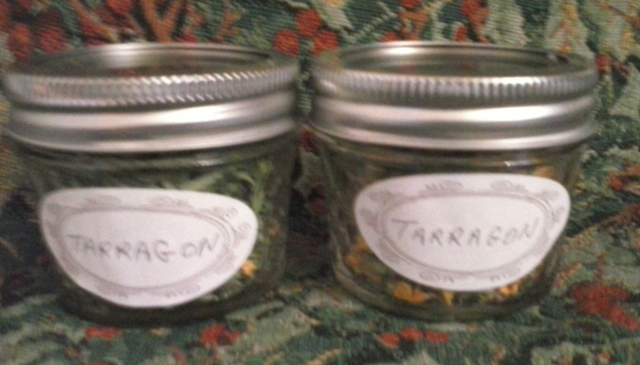 Plant a bunch of tarragon. It grows like a weed and I speak from experience. It's a beautiful plant with delicate yellow flowers and a wonderful fragrance. The bees love it and so do people. Tarragon is a great spice for chicken and fish. It can also be used to made infusions in vinegar and oil for salads. 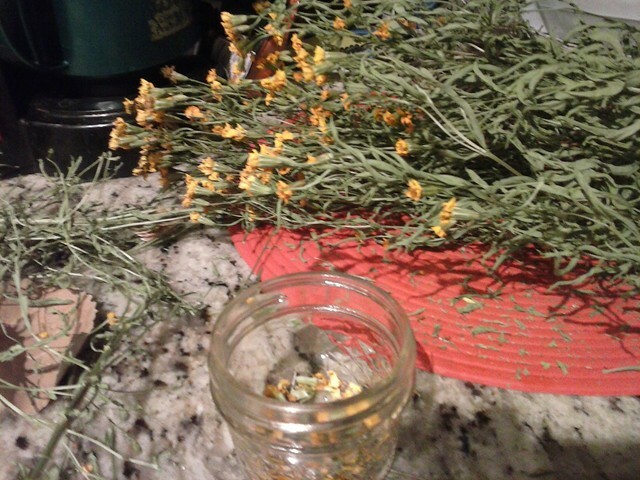 Its fragrance is so great that it can be used in homemade soap, or simply in an open dish to refresh a room. Some people even make sachet pillows of tarragon. Below is a photo of the finished product. Tarragon in the store can cost as much as $5 a jar and it's not nearly as fresh and pretty and there are certainly no blossoms in it as there are in these. By the way, the blossoms are an added bonus. 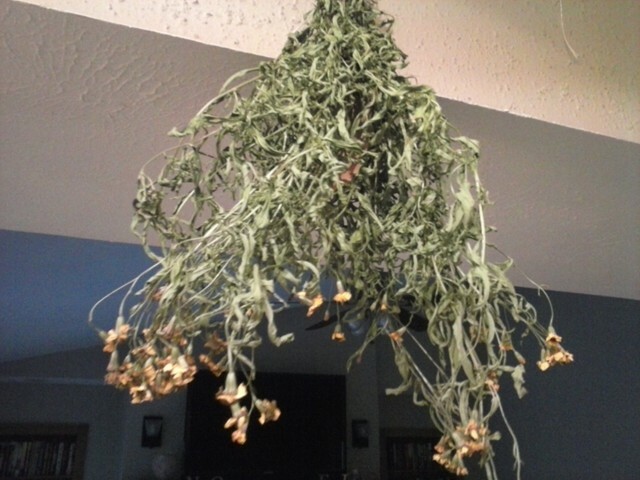 You can tell the recipient of your gift that if they rub the dried flower between their thumb and index finger they will have more than enough seeds to grow their own tarragon. 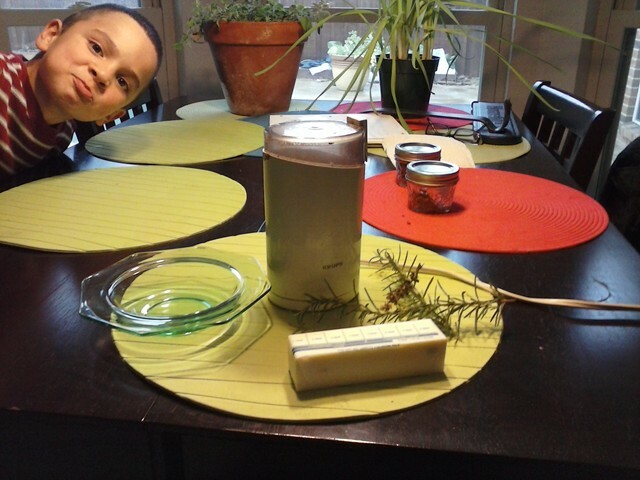 If you have no herbs, here is a gift that you can make with children this weekend. In fact, I'm doing it myself. 1. Wash a used tin can. 2. Use a Christmas cookie cutter and trace a star with a magic marker on the tin can. 3. Use a hammer and nail to punch holes using the outline of the star as a guide. 4. (optional) punch two holes near the top of the can that are directly across from each other. 5. String wire through the holes and twist to make a handle. If you really want something fast and fun to do with children, call me at 972-571-4497. Loving Garland Green (nonprofit) is selling one pound bags of pecans for $5.00 and we deliver to Garland residents--even in the rain. These pecans are for cracking. If you want to put a little bit of old-fashioned into your holiday, there is nothing like sitting down before the fire and cracking nuts with your children and grandchildren. I daresay there are children today who don't even realize that nuts have shells or even where they come from. By the way, if you happen to be in one of our many Garland Parks this holiday season, take a close look at the trees. There's a good chance that at least one of them is a Texas Native Pecan. 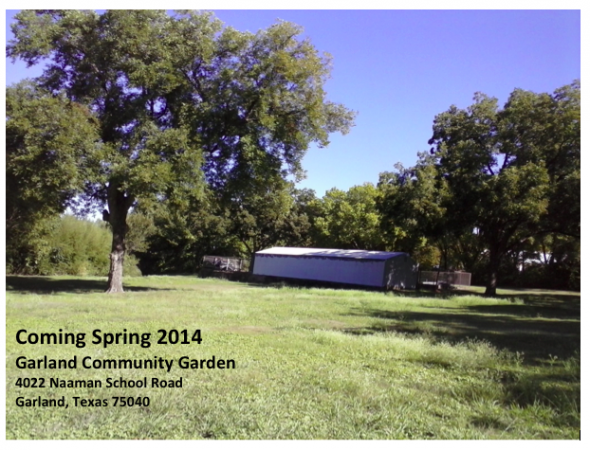 We have more than 8 pecan trees on the proposed site for our first Garland Community Garden at 4022 Naaman School Road. I'm excited about "Loving Garland Green" and our mission to ensure that Garland has at least 50,000 urban gardens/farms by the end of 2016 because I am convinced that we are all going to be in a lot of trouble if we all don't start growing more of our food locally. Many would argue with substantial evidence that we are already in trouble, even in the USA, when it comes to feeding all the people in our nation. More and more--on Eat Green as well as on other sites--we are reading about the importance of growing more of our food locally. This is the beginning of something better. We must move from an oil-based economy back to a plant-based economy. An oil-based economy is unsustainable. First of all it is unsustainable because of the growing scarcity of oil. 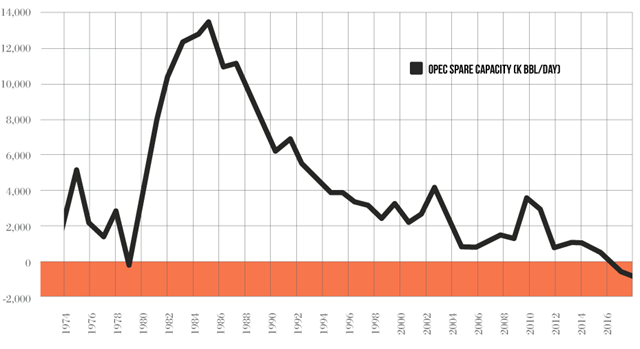 By 2016 OPEC's spare capacity of oil will be depleted as shown in the graph below from Sustainable America. Although some could argue that OPEC has waning importance in the USA because of the rise in production of shale oil, OPEC still produces about 40% of the world's crude oil and the availability or nonavailability of OPEC oil affects prices on the world market and thus also affects the prices of oil in the USA. Second of all, an oil-based economy is unsustainable because of the rising price of oil per barrel. Back in 1941 an oil-based economy (one in which oil is the basic building block for running industry and a component for many of the materials for building the products such as plastics)--made economic sense. In 1941 oil sold on the world market at a few cents over one dollar per barrel. The price for a barrel of oil has hovered right at $100 a barrel for the past 15 years or more. For example, today, December 11, 2013 it is selling at $97.44 a barrel. This is not sustainable and it hasn't been for at least the past 15 years. Why do we persist in propping up an oil-based economy? The influence of big money from people whose fortunes are tied to the oil market is the best answer to that question. How do these people prop up the oil-based economy? They buy politicians who will assist them in propping up the oil-based economy. They ship jobs overseas to take advantage of slave labor. Many folks don't understand the economic connection between oil and loss of jobs here in the USA, but cost is always an important factor in the computations for profit. When the base material, oil, costs $100 a barrel, you have to make up the difference somewhere. The somewhere is labor. Through political influence these people continue to do all they can to impede the greening of the USA and have for years. This is not a conspiracy theory. It is verifiable fact. Is a plant-based economy a viable alternative? Absolutely! The Sustainable Biomaterials Collaborate reports that less than 200 years ago, our economy was a carbohydrate economy. In 1820, Americans used two tons of plant material for every ton of minerals. Plants were the primary raw material in the production of dyes, chemicals, paints, inks, solvents, construction materials, even energy. Cotton and wood pulp provided the world’s first plastics and synthetic textiles. In 1941 Henry Ford built a car made almost entirely of hemp. Watch the video Henry Ford Hemp Car. Today, we have only a handful of true city-states: Monaco, Vatican City, and Singapore. Yet there is evidence here in the USA of city governments taking over some of the roles once considered the domain of our federal and state governments. I expect this will continue. For example, over the past year I've noticed several US cities voting to raise minimum wage in their municipalities. For the most part, setting minimum wage has been the responsibility of government at federal and state levels--not local. San Jose is one example I recall. They raised their minimum wage to$10 an hour. It is estimated that raising their minimum wage will result in an additional $70 million stimulus to their local economy in just the first year and even more as time goes on. Local merchants are reporting that, contrary to popular misconception, their businesses have not been hurt by paying their employees more. As Washington DC and many state governments continue to brawl instead of problem-solve, we can expect local people and local governments to empower themselves to create solutions that do work and that do serve the majority. Among these solutions we see the rise of community gardens and urban farming. The more food grown and consumed locally, the more economically secure and robust the community. This is definitely a lesson that local government leaders and ordinary citizens seem to know. GROW FOOD. GROW YOUR LOCAL ECONOMY. I was thinking this morning as I prepared the thank-you note for Delores for standing up for Loving Garland Green that we are making our own dreams come true. It's a rather amazing as well as empowering experience. If you've read my posts, you know that I've expressed more than once the belief that a local plant-based economy can increase the health, prosperity and wealth of the local economy. Now, with our first fund-raising drive--Selling Texas Native Pecans for Holday Cooking--we are seeing that belief put to the test. By using only found plants (pecans) taken from Garland parks, we will be creating at least $1,000. Unfortunately, unlike some of our later examples, this money will not be circulated into our local economy. Instead, $925 of it will go to pay for fees required to file as a nonprofit corporation in the state of Texas and then with the IRS. Still, we are clearly demonstrating the ability to make money from plants grown locally in Garland. We plan to demonstrate this again in early March by selling bamboo poles to be used for plant stakes in local gardens. Again, the materials for this fund raiser will also come to us free from Mother Nature as we will gather these poles from the bamboo forest at 4022 Naaman School Road--being careful, of course, to be prudent with the number of poles we harvest from the forest as we want to maintain the bamboo forest as one of the viable features of the Garland Urban Agricultura Center and Community Garden. The bamboo forest as well as a walking lambyrinth are two features that we hope to have established as attractions in the early spring of 2014 as they both will require little work. THANK YOU FOR LOVING GARLAND GREEN! You have just purchased some Texas native pecans. Members of Loving Garland Green, a soon-to-be Texas member-directed nonprofit corporation, handpicked these pecans from Garland Parks and packaged them for sale as a fundraiser in our community. The pecan is native to Texas. It is the official state tree and can be grown in every area of our vast state. It is a part of Texas tradition. The little Texas native pecans come with some good lessons for us all. Among them is the lesson that "bigger is not always better." The small Texas native nut size, alternate bearing, low yield and many other characteristics of native pecan production are a vital part of pecan survival in Texas and should be considered good. Today's pecan growers push their trees far beyond the natural limits of production of native pecans. Those of us at Loving Garland Green support and encourage crop diversity. Thus, it should come as no surprise that we encourage the planting and use of Texas native pecans and especially their planting in our local parks. The proposed site for the Garland Agricultural Center and Community Garden at 4022 Naaman School Road comes ready-made with at least 6 mature Texas native pecan trees. You have joined the ranks of those who know that together as a community we can love Garland green. By helping to increase the number of urban gardens within our city limits, you are also raising up many other desirable factors as well: Increased food security for all; increased prosperity; increased self-sufficiency as a community and as individuals; a stronger economy; new job creation; healthier lifestyles; increased beauty; and more. We thank you and look forward to working with you to discover more ways to increase the number of edible plants and people growing them in our community. 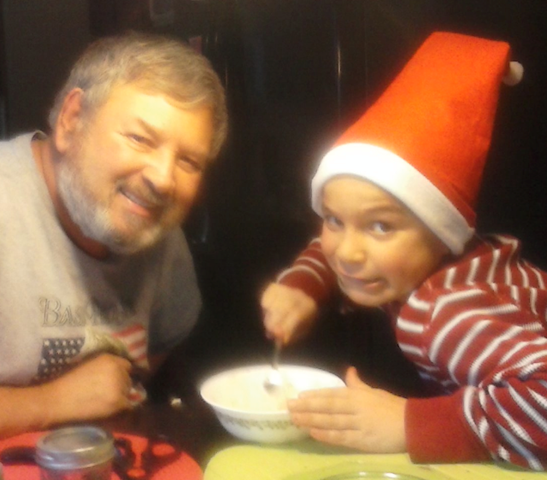 Our website, LovingGarlandGreen.org will be open to the public on Christmas Day. Be sure to visit us there for more detail about our upcoming activities. We hpe you will continue to walk with us on this trand adventure of loving Garland green. Who knows where the road will lead us. 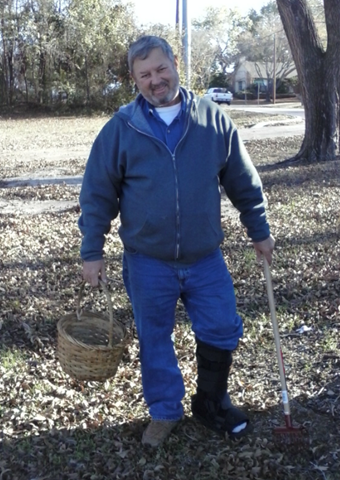 Charles Frank Bivilacqua, Board Member of Loving Garland Green, gathering Texas Native Pecans for our December Fundraiser at 4022 Naaman School Road. 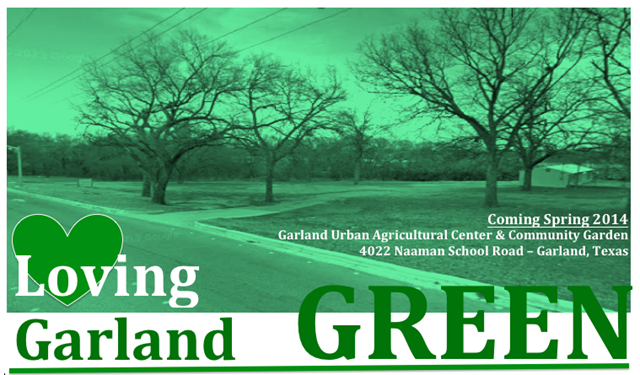 Loving Garland Green is moving forward as usual in the direction we intend. We expect to file as a nonprofit corporation with the state of Texas during the first week of December, and we officially begin our Texas Native Pecan Holiday Fund raiser tomorrow, December 1. We are selling the pecans in their shells at $5.00 a pound or for any additional price donors would like to contribute. Please call me at 972-571-4497 (Liz Berry) if you would like to purchase some and make a donation. 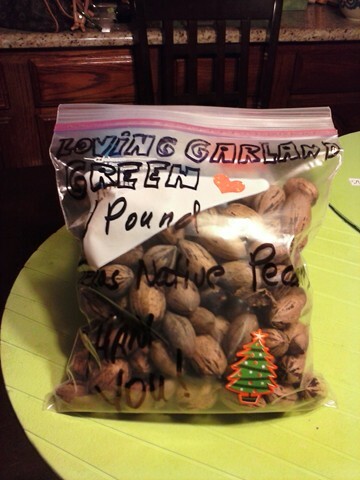 Delores Elder-Jones is the very first Garland resident to order pecans from Loving Garland Green. I got a telephone call from Delores today. She ordered five pounds of the Texas native pecans. I'll deliver them to her home tomorrow--an appropriate day. December 1 also happens to be Delores Elder-Jones Day here in Garland. Delores was honored in 2009 for her long-standing, dedicated service to the Garland community through her college community outreach work and volunteer service on numerous Garland community boards and agencies. Delores is a very loving and giving person. Today I visited her Facebook and read that she is appealing to people to help a woman in need. This woman, named Flora, is currently living in a broken down motor home up by Lake Lavon. She has no transportation. The motor home has a blanket hanging where a door should be. She wears socks with flipflops for her shoes. She does have a coat and she has sweatpants, but that's about it. A special thanks to the Mayor's office (and Mayor Athas) as well as to several Garland city departments: The Garland Engineering and Maps Department, the Garland Parks Department, the Garland Health Department and the Garland Water Department. So many folks from our local government have provided assistance to answer questions for members of Loving Garland Green as we continue to do our research and planning for the development of this site as the Garland Agricultural Center and Community Garden. Anita Flores, Loving Garland Green Treasurer and Robert Opel, board member, have deposited 7 large leaf bags at the site. At the next meeting of the board (December 5 - 6:30 - my house) I will propose that we gather enough shipping pallets to build 4 compost bins during December. If you are interested in composting, here is the link to a video that illustrates how to build one of these bins [https://www.youtube.com/watch?v=v2F8fEvx6N8]. With a little bit of luck, it should not cost us any thing as long as we can get the pallets for free. If you know of a free source for these pallets, please call me at 972-571-4497. Loving Garland Green has ambitions with roots that go deeper than a community garden. We hope to build and strengthen, if not transform, our local economy over the next two years by increasing the number of urban gardens in Garland to 50,000. Among other things, we hope to track the development of new gardens on our website by featuring many of them and showing the connectivity of these gardens to the increased prosperity of our community. We believe there is a direct correlation between the number of gardens in a city and the overall prosperity and happiness of its inhabitants. We expect to see a diversity of business models arise in our community as a result of our promotion and educational efforts to raise awareness of the fun and profitability available to citizens who grow food in their back yards and even front yards. We expect to see many cottage industries appear on the scene. For example, as more people become aware of the ease and importance of composting, there will be an increased need perhaps for a local factory that produces compost bins. Who wouldn't want to live in the City of Gardens?